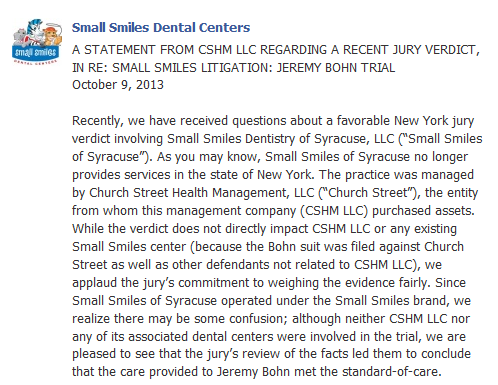 Is CSHM, LLC taking full responsibility for all future legal actions against Small Smiles Dental Centers? You decide. In making this claim, they must also be taking full responsibility for any and all illegal activities and/or malpractice issues that could arise in the future, right? As the below email suggests, those will be coming. Hi - I have kept up with your site for a while now because honestly it was the only way to find out the "real" news on Small Smiles. I am former employee of Small Smiles in South Carolina. When I took the position I had NO clue what I was getting into. I resigned from my position due to the horrible reputation Small Smiles has and it was mentally exhausting to even go to work. I have been told by a current employee that they are now mandating all employees to work on Saturdays! They already make employees work extended hours and now this! Also in the “morning huddle” a few weeks ago, employees were told that due to budget cuts - that they needed to reuse gloves if they were not soiled. GROSS!!! They were also told to use the same mask and not use a new one from patient to patient. Anyway keep up the good work spreading the news about Small Smiles. Let’s face it, if even one Small Smiles Dental Center is open, there is assurance to be future litigation. In other news, CSHM, LLC announced recently it will be closing or has closed its Santé Fe, New Mexico clinic. UPDATE: Santé Fe office is confirmed closed. Also, according to sources they have removed corporate office contact information posted in the clinic to inhabit anyone from contacting the corporate office in Nashville. This would be yet another direct violation of the “Quality of Care” Corporate Integrity Agreement CSHM, LLC has with the Office of Inspector General of the Department Health and Human Services.